Strictly speaking, 'pointing' refers just to the outer section of a mortar joint that beds one brick on another, or where the whole joint has been replaced at a later date. Exterior walls are afflicted with two modern menaces; cement-based pointing and waterproof paints. Both are relatively cheap to apply, make a building look 'smart', but can cause major problems and cost a fortune to remove. Weatherstruck pointing is ugly with all the awkward slope-to-slope joins. It is claimed to throw water off the wall but this seems unlikely - the mortar protrudes perhaps 1mm. In one of the wettest cities in the UK, Belfast, you rarely see this style of pointing - in any kind of wall on any kind of building. 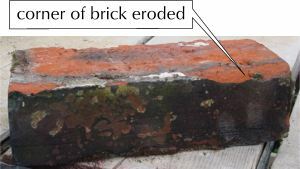 The picture below shows the damage caused when bricks bedded in lime mortar are repointed with cement mortar. This brick was in a chimney - a particularly exposed location. The counsel of perfection is to leave the pointing to erode naturally; the effect of rain, frost and wind will in most climates be a gentle process and cause no collateral damage. In practice, this will take some years and during this time there is a higher risk of other problems. What we need to do is balance the risk of damage from leaving the cement in place, the risks from the removal process, and yet to preserve the aged appearance. If we remove the pointing, we must do so in the most careful manner, avoid damage to the bricks, and then repoint with lime mortar to the same finish as the aged original. If new brickwork is laid, from example to fill in a window aperture, it is critical that you use lime mortar and that the mixture is not too rich; if the mortar is too rich or is cement-based, moisture can evaporate only through the surface of a single brick, rather than spreading through a wider area, and this accelerates erosion of the brick surface through frost damage and salt crystallisation. If a cement mixture is too rich, it will tend to crack away from the brick, encouraging water to enter the wall by capillary action. If lime-based pointing is damaged, you have a relatively straight-forward though, if the area is large, tedious project. Lime mortar is softer than cement, and therefore easier to remove. In most climates, the loss of pointing to a depth of less than 10mm should not cause problems; repointing would not be a high priority. Equally, cracks and holes are not of concern. To find out what type of martar you have, take a screw driver to the mortar. If you scratch at it and it does just scratch the surface then you have cement, if it crumbles then it is likely to be lime-rich. If there are holes so you can get to the mortar bed between the bricks, check this too; it is possible that the wall was originally built with a lime-rich mix and then repointed with something harder. The ideal is to match the bedding mix, but if in doubt, use a lime/sand mix. The worst that can happen is that it will need attention again in, say 10 years time. If you use a harder mix then the bedding, that is when damage to the bricks can occur.